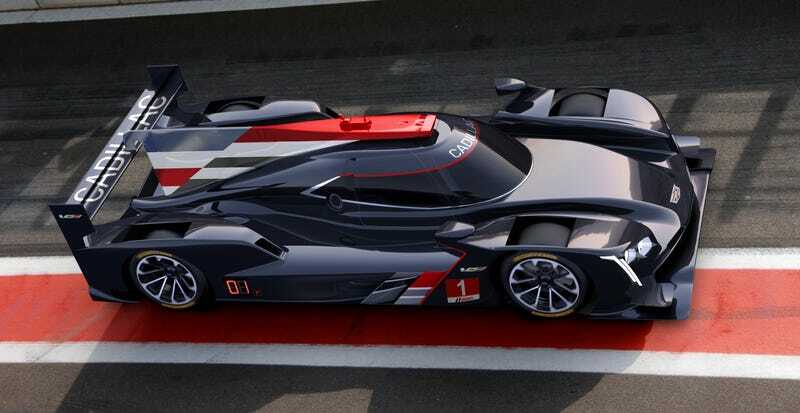 After a 14-year hiatus, Cadillac is getting back into purpose-built racing prototypes in the IMSA WeatherTech Sports Car Championship with its new Cadillac DPi-V.R, and it looks fantastic. It’s built to the new DPi spec for the series’ top Prototype class, and will make its debut at the 2017 24 Hours of Daytona next January. Powered by a race prepared 6.2-liter naturally aspirated and dry-sumped Cadillac V8, this prototype is bound to sound as good as it looks. The engine, which shares some architecture with the V8 used in the CTS-V and Escalade, produces approximately 600 hp in IMSA trim and has a maximum allowable RPM of 7,600. That 600 HP is fed through a meaty X-TRAC transverse sequential paddle-shift racing gearbox to power the rear wheels of the car. A viscous mechanical limited-slip diff helps put that power to the ground and avoid the shame of having only one wheel spin in post-race burnouts. Best of all, the Dallara-chassis car only weighs 2,050 lbs, so to say it will go like stink should be an understatement. Cadillac last competed in prototype endurance racing in 2002, with the Northstar LMP car in Le Mans. The new car will be run by two teams who previously ran Corvette Daytona Prototypes in the series, Action Express Racing and Wayne Taylor Racing. Meant to bolster Cadillac’s V-Performance brand, which includes the ATS-V and CTS-V, the DPi-V.R includes several visual cues from Cadillac’s sportier road cars, in its lights, its chunky, angular body style, and numerous V-Performance emblems and graphics which will no doubt make it onto the cars’ team liveries. Its air intake, for example, mimics the shape of the Cadillac crest. Additionally, the car features V-Performance wheels and Brembo disc brakes. No one’s going to complain about this one sharing gauges with a basic GM truck, that’s for sure, but it does share the rear camera mirror used in the CT6, CTS, XT5 and Escalade. Hey, you’ve got to see behind you somehow. Either way, it’s the best looking Cadillac I’ve seen in years.